Not Just A Blonde is One! Happy Anniversary! 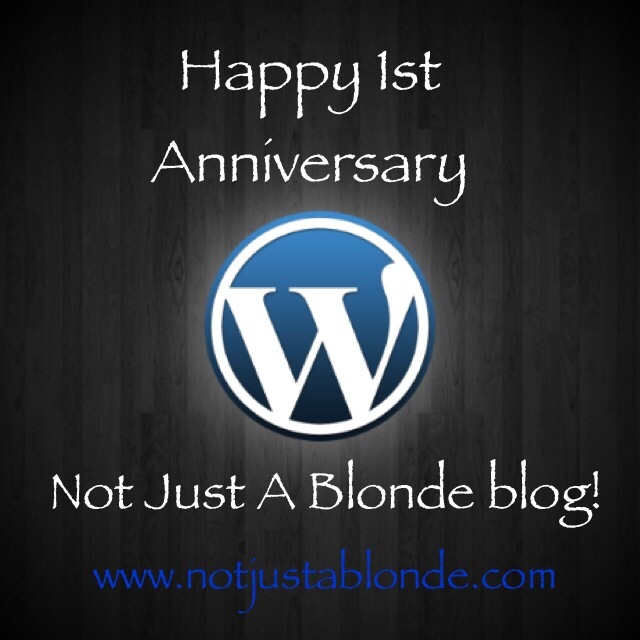 It’s hard to believe just one year ago I brought my Not Just A Blonde blog home to rest here at WordPress. I came here from Blogger where Not Just A Blonde was born due to the increase ease and ability to connect with other bloggers and share ideas and deep-thoughts. It was a good move… make that a great move! I want to thank all of you who have traveled this journey so far with me! Thank you to my soul sister Erika Finn at Urth Mama for encouraging me to write a blog in the first place! Thanks to my fellow blogger Blue Jean Femme at The Pink Triangle Cafe for her belief in me and in a world where we can do better! A special thank you to Tim Chastain at Jesus Without Baggage for his open-heart, open-mind and encouraging words. Last, but by all means not least thank you to God (aka Higher Power, Holy Spirit, Creator) for having a beautiful plan for my life that included this sacred place for my soul to retreat to and to connect. I’m one lucky blessed Blonde! Here’s to one amazing year of spiritual growth! Thank you all! Congratulations Ann! A proud day for you. Happy 1 yr ANNiversary and keep up the great work. I believe in you, m’dear, just not the world. 🙂 I am glad to have connected with someone who is forcing me to reassess my view of people. That makes sense. I was surprised that I had followed your blog only for a year. I guess I just don’t remember the venue change, though I am sure I was aware of it at the time. How long were you with Blogger? I started to blog on blogger January 2013 and then last April created my Not Just A Blonde presence on WordPress. For awhile I posted to both sites as well as reposting my favorite blog posts to the new WordPress one! I just took a peek at my blogger site and it seems I officially made the final switch to WordPress in August of last year. WordPress notified me yesterday that it was my anniversary! I was surprised too! I feel on someways I have been logging forever and in other ways like I’m still figuring it all out! I do know it has been a blessing and I’m so glad I listened to my heart and began the Not Just A Blonde Journey! Ann. Thank you for inviting us all here to share our time with the Almighty One and you. Also thanks to Tim for putting NOTJUSTABLONDE on his site as one of his favorite sites, otherwise the Almighty One would have had to find another way to guide me here. I’m glad you did. When I first “met” you I was broken and suicidal. I will always appreciate you and Finally for your love and kindness relayed through this blog. You didn’t know you were a life saver, eh? Debbie and I are back together. She realized that the people she was trying to please was not around that much. She found herself alone and missing me and realized that I would be there when others would not. These people who tell her how to live have their own lives and basically it does not revolve around her. Her daughter is despising her because she is embarrassed when people ask where her mother is. Her 30 something year old daughter told her that she would not accept it (she didn’t even confess to our relationship, just the roommate part to save money).. she would not support it nor would she have anything to do with it. So she’s having a tough time right now. But I told her that it seems right though hurtful that God would allow Debbie to suffer the rejection in the name of holiness if we are to be ministers that minster the Gospel of love. Eventually God will reveal to her daughter her heart. Just as He is doing to the general church body at large. How can we plea a case for the Love of God and His children if we do not understand the suffering of being rejected by one’s own family. The hypocrisy is… God’s love is boundless … limitless… eternal and not conditional. I thought I knew God’s Love until I met Debbie.. now I understand so much deeper because if I can love her this much..want the absolute best for her..will do anything in my power to make her happy, how much more, God.. who is able to do exceedingly more.. Thank you for sending me love and encouragement so that I could be here long enough to see this day. God’s love for us really IS immeasurable! I am SO happy for you and for Debbie in all that you have been through and overcome! I will absolutely keep you and Debbie in my prayers! It is so difficult to be judged/rejected especialy by one’s own flesh and blood. I will be praying for her daughter as well. I believe God will speak to her heart and I will pray she is able to hear His voice. I do think times are a’changing in the church. Congratulations! You inspire me every day. I know that God is working magic though you here and I hope we have many more years of “Not Just A Blonde”. Love you!